Last weekend when we went food shopping we found on sales some huge shrimps at a price so low to make a ham and cheese sandwich look expensive. Strangely enough they were actually fresh, or at least freshly thawed, and they did smell like proper shrimps. The nice fresh shrimps we unexpectedly found! In the last year in the area where we now live, due to the financial crisis, the availability of any decent produce has been marginal at best and normally leaves us wondering about what to eat. A lot of times even the dogs do not want to eat what they sell around here. It is one of the main reasons we want to move back closer to civilization as the local stores do not stock anything decently edible as it does not sell at all. Besides chicken which is somewhat edible when you are lucky, normally any meat or fish is a luxury as nothing of quality or that is actually safe to eat is on sale. Judging from the smell in the stores, most of it just rots away, and we are talking major supermarket chains like Wal-Mart or others. In any case we were pleasantly surprised to find very nice large shrimps at a very low price and we bought some for our Sunday meal. I had planned to do some brochettes or something similar on the grill, but the weather did not cooperate. I ended up inventing a recipe on the spur of the moment with whatever leftover ingredients I encountered in the larder. With what I found it ended up to become a nice pasta in an Mexican-Oriental style that turned out extremely good and satisfying. It was a long time that we had not enjoyed something so good at home, just due to the unavailability of good products at the supermarket. 1. Cook the dried pasta until al dente in plenty of boiling salted water. 2. Once cooked strain the pasta, return it to the pot, and fill with cold water to stop the cooking. 3. After a minute or so strain the pasta again and return to the pot. 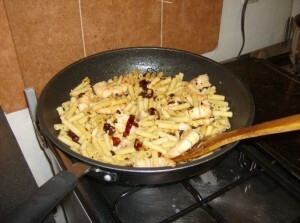 Put a tablespoon or two of olive oil on the pasta and mix well with a spoon. Cover and set aside for now. 4. About 10-15 minutes before cooking the meal, place the cleaned and deveined shrimps in a bowl, sprinkle the mixture of citrus peels and sesame seeds, and add a few tablespoons of the tequila. 5. In a very hot wok sautÃ© the shrimps in a little olive oil. When they start to be opaque carefully add some tequila to the wok and flambÃ© them. Return them to the bowl. 6. Add a bit more olive oil to the wok and briefly sautÃ© the Ã©chalotte, guajillos, and garlic. 7. 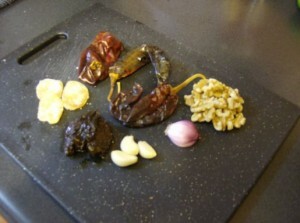 Add the reserved pasta, the sundried tomatoes, the walnuts, the candied ginger, and the Sambal Oelek. SautÃ© until warm. 8. 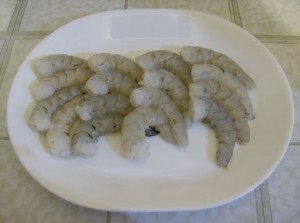 Add the shrimp and warm them up in the mix and add a splash of tequila, and some sesame oil to finish them. As some of you might have noticed, the main part of the website was extensively updated in the middle of last week. We finally had time to add the various services we are offering here in Mexico City. Those services are both for the general public and the food and beverage trade. We have an introduction to wine course that is scheduled for November and also a motivational conference. All of our industry services are available worldwide and can be done remotely or on site as required. Have a look at the main site to get an idea of what we do, and for those interested more information on the courses is available here. In the new year we will start offering regular weekly classes once we are installed in our new premises. We will also be launching a Spanish version of the blog in the coming month and doing an extensive revamp of the current site. The main site is already in both languages.